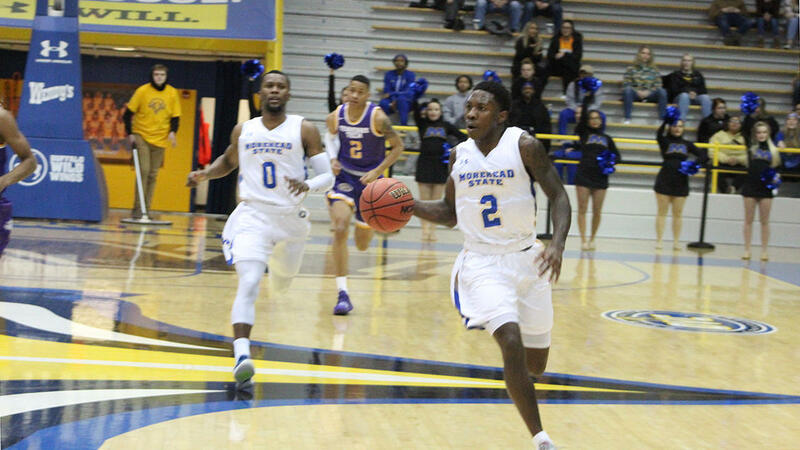 The Morehead State men's basketball Eagles won their fourth straight contest, defeating Tennessee Tech in a slugfest, 67-61, Thursday night at Johnson Arena. With tonight's win, the Eagles have won four in a row for the first time since the 2016-17 campaign. Morehead State improved to 8-12 on the season, and 4-3 in Ohio Valley Conference action. Tennessee Tech fell back to 6-14 overall, 2-5 on the league slate. "I'm proud of our guys for finding a way to win down the stretch in an ugly game," said head coach Preston Spradlin. "Defensively, I thought we did a phenomenal job defending initial possessions, we just didn't finish the way we hoped, giving up offensive rebounds and second chance points. Credit to Tennessee Tech for contesting us at the rim and really making us work around the glass." Senior Lamontray Harris logged his eighth double-double of the year, and the 16thtotal for his career, tabbing 12 points and 11 rebounds. Throughout the Eagles' win streak, the Louisville native is shooting 27-for-38 (.711) from the floor. MSU was led in scoring by junior Jordan Walker, who pitched in 20 points. The Indianapolis product also nailed 4-of-8 from behind the arc. In the last four contests, he is clocking in at 10-for-19 (.526) from downtown. Rounding out the double-figure performances for the Eagles was sophomore Malek Green, chipping in with 11 points. The second-year player from Cincinnati also contributed on the boards with six, alongside fellow sophomore James Baker, reeling in the same amount of boards. Tennessee Tech was led by Junior Clay, who poured in 26 points. The Eagles led by as many as 16 early in the second half, before the neighboring majestic birds shrunk the deficit to three with 4:27 remaining. However, MSU was able to overcome its mid-game slump at the charity stripe, connecting on its attempts down the stretch to close out a victory. Morehead State will conclude its four-game slate at home, squaring off against Jacksonville State this Saturday. Tip-off at Johnson Arena is scheduled for 3:35 p.m. ET.